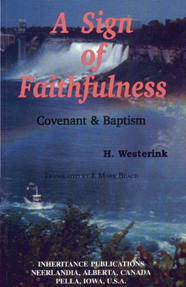 H. Westerink's book on Baptism is a jewel. One seldom comes across a book that simultaneously matches such simplicity to profundity, and vice versa. The author excels at clarifying the marvellous continuity (and discontinuity) between the old and new covenant with respect to the question of baptism infant baptism in particular. C. Bouwman in Una Sancta: . . . because Booth understands the children of believers to be God's children by covenant, Booth can also write some very Scriptural words about the Christian family and the task of parents toward the little children-of-God entrusted into their care. Christine Farenhorst in Christian Renewal: Highly recommended for everyone who knows a child. In other words, this book is recommended for everyone. Easy to read, genuinely Biblical and tremendously helpful, make sure this pearl of wisdom becomes required reading in your Bible study. Celebrating the Sabbath by Bruce A. Ray. This book explains what's so special about the Sabbath and how we can make the best use of Sundays in a fast-paced world. Who are the children we habitually tuck into bed, drive to their hockey games, assist with their homework and take along on holidays? In the midst of life's busyness, is raising the next generation simply another of life's many demands competing for our time and energy and resources?? This publication follows the historic Form for the Baptism of Infants to explore Scripture's answer to questions about children's identity. The author draws out that God Himself has formed a bond of love with the children He has entrusted to believing parents, and so these parents receive a most privileged function in God's kingdom - training the next generation of little ones to know their Father in heaven. He concludes that the greatest contribution godly men and women can make to the kingdom of God and the nation to which they belong is to impress on their children the glorious identity with which God has marked them, and train them to live in a fashion consistent with their royal distinctiveness. The privilege of parenting: there's none like it. 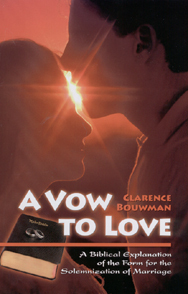 Clarence Bouwman received his theological training at the Canadian Reformed Theological Seminary in Hamilton, Canada. His marriage to Arlene has been blessed with six children, and they now delight in seeing their family expand with the arrival of a new generation of covenant offspring. While raising his family, the author served as minister of the Word of God in four congregations in Canada and Australia, currently serving as minister of the Canadian Reformec Church of Yarrow, British Columbia. He has written several other publications, including The Overflowing Riches of my God (an explanation of the Belgic Confession), Notes on the Canons of Dort, Spiritual Order for the Church (the Biblical basis for Reformed Church Polity), A Vow to Love (a Biblical explanation of the Form for the Solemnization of Marriage) and To Live is Christ (sermons or the Letter to the Philippians). Cathy Steere shares, with an honesty that cannot be missed, the story of how she and her husband David trained their autistic son Drew in ways that point unmistakably to the sufficiency of God's Word to guide us in all of life. It is a moving testimony of how God honours those who honour Him and trust His promises more than the emptiness of men's philosophies. 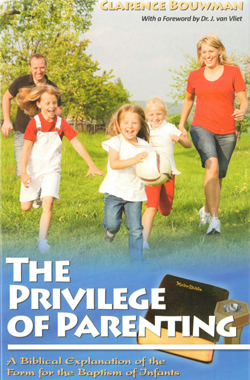 The story will be an encouragement to all parents seeking to train their children in the discipline and instruction of the Lord. For Better or For Worse? Whichever term describes your marriage, there are ways to make it (even) better. That's because God has designed marriage to be be a relationship of deep unity and strength. Despite the challenges that couples face today, marital harmony need not be considered an impossible ideal. Does your marriage fulfill your dreams? Are you not yet married but eager to wed? Are you afraid to marry because you've seen so few happy marriages? R.C. Sproul offers this practical guide to help married couples  or those seeking to get married  develop the skills of Marriage. Diligently scriptural, The Intimate Marriage shows how marriage can have an abundance of joy when grounded in the wisdom of God. In this publication the author takes us through the Bible to discern what God's plan for marriage initially was, how the fall into sin has twisted marriage, and how God's plan has been restored through the work of the Lord Jesus Christ. In the process he discusses the role of husband and wife in marriage, the permanence of marriage and how to overcome trouble in marriage, the place of sexual intimacy, the timing and size of the family, the impact of immorality on marriage, and so much more. He concludes that the church's time-tested Form for the Solemnization of Marriage accurately summarizes God's answers to the many questions facing those who marry today. Discover how God can make your marriage glorious. "A book that every Reformed woman should read!" M.F. of F.O.